I’m having a flat shoe love affair at the moment. I’ve ditched the boots and wedges and have been stomping around town in my brogues and loafers instead. And it’s been safer for everyone. I upped my shoe game at Christmas, adding some sparkly little numbers to my collection and I’m in desperate need of a clear out to make some space for them in my wardrobe. 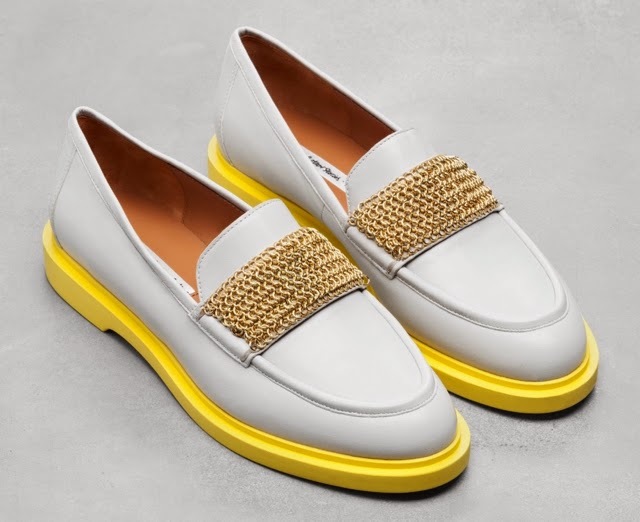 Not forgetting these Chain Leather Loafers from & Other Stories which are too good to resist. I’ve had my eyes on these bad boys for a while now, being sucked in by their canary-yellow soles, pale grey leather upper and heavy chain detail on the vamp. They’re a bold, brash and perfect for summer. In fact, they’re so perfect, I want to own them now. They’ll brighten up an all-black outfit, pep-up jeans and shirts and look just awesome against pleated midi skirts. Sold.